Well I just got back from seeing the Death Note movie in theaters, and I’m going to try not to reveal any of the plot for those that haven’t seen it yet. But let me apologize first in case I do. I got there at around 7:10, and figured that there would be a lot of people there. I was right. I was lucky enough to find a good seat, but the theater was already packed. I could hear everyone talking about Death Note, and knew I was among fans. As soon as the movie started though, I was a bit disappointed. I don’t remember VIZ saying anything about the Death Note movie being dubbed. Yes, that’s right. Dubbed. Even though, once I got over the fact that I was hearing an English voice over, I got wrapped up into the story. I think that is what VIZ was hoping. By not having subtitles — which I still perfer — it allows the audience to fall deeper into the story… especially by the type of audience they were hoping will see the movie. That audience… I should of known. Now I expected to be among fans. What I didn’t expect was that at every important moment in the movie to be assaulted by girls screaming that sorta scream you would hear when a group of JPOP fangirls see’s Jun Morimoto, or any member from Arashi for that matter. The females in the theater went crazy when we first saw Light… when we first saw Ryuk… when we first saw L… when we saw L eat a piece of candy… and every time L ate a piece of candy from here on out. I’m interested to see if anyone else that saw the movie had the same sorta fan base in your theater. What I did like about the movie is that they were able to successfully adapt the manga/anime into a live action movie. One thing that I hate about anime going to live action is that they usually shorten the story and twist events in order to save time. I can tell you that in the whole movie, only one or 2 minor things are changed, and they did a good job about staying true to the manga/anime. 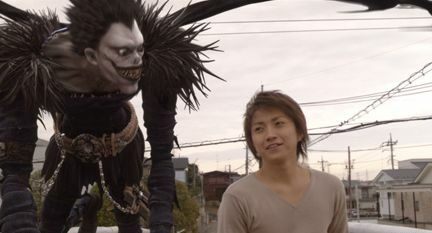 The credits are worth staying for if you are a true fan of Death Note. They announced there was a special behind the scenes documentary after the movie, but half of the theater left as soon as the credits hit the screen. I would also recommend staying because somewhere in the credits they let you know something that you may already expect during the last scene. Tomorrow is the last day to see the Death Note movie in theaters, so if you havn’t, head over to Fathom Events to purchase your tickets and find out what theaters Death Note is playing at near you.